Troubling figures exposed by Rabbinical Center of Europe, showing 40% hide their Judaism faced with growing anti-Semitism. Research conducted by over 800 rabbis of the Rabbinical Center of Europe (RCE) and European Council of Jewish Communities (ECJC) has revealed that assimilation in the European continent has reached a shocking rate of 80%. RCE clarified that the appalling figures were clarified through an analysis of the amount of Jewish weddings compared to the number of Jews in each city, in updated statistics confirming troubling trends the group previously reported. Rabbi Menachem Margolin, Director General of the RCE, further noted that according to the figures gathered in over 800 communities throughout Europe ahead of the Jewish New Year (Rosh Hashana), assimilation is not the only dire threat confronting European Jews. According to the RCE's figures, around 40% of European Jews choose to hide their Judaism, and another roughly 75% do not study at Jewish schools, signalling a crisis for the sustainability of European Jewry. The decision to hide Jewish identity and not attend Jewish institutions comes amid a skyrocketing increase in anti-Semitism in Europe; research showed that anti-Semitic incidents in Europe spiked by 436% in Europe in July compared to the same month in the previous year. Rabbi Margolin pointed to the influence of rising right-wing extremism in Europe, Islamic fundamentalism and the anti-Semitic spillover in the wake of Operation Protective Edge as the largest challenges facing European Jews over the last year. He noted a significant rise in anti-Semitic attacks on Jews and Jewish institutions. The rabbi added that the rise of the far-right in European Parliamentary elections means it will be harder to find support from the government, but added that the RCE will continue doing all it can to petition the European leadership to defend its Jewish citizens. One potentially bright spot in all the gloomy figures is that anti-Semitic attacks in public schools have caused hundreds of Jewish children to transfer to Jewish schools. Likewise there was a growth of 17% in synagogue attendance as compared to the previous year. 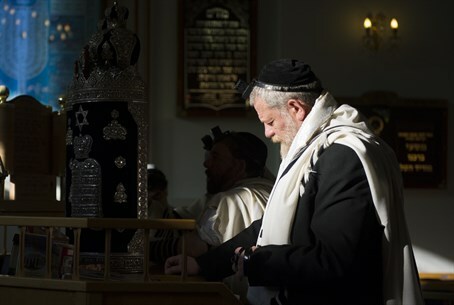 According to the figures, roughly half-a-million Jews in Europe will take part in prayers at 1,353 synagogues throughout the continent on Rosh Hashana.